Decide and Commit means that you have a plan and you're sticking you it. This all happens before you get down on the shot. Remember, no matter what you decide to do, it's your decision. It's very important that you believe in yourself and in your decision. If you don't, the balls don't lie. If by any chance you are not fully committed to your choice, force yourself to stand up, make a new plan and address the shot again. If a rowdy teammate or a passing server catches your eye, you are no longer fully committed to the shot. Stand up, recommit yourself, and address the shot again. How many times have you not given 100% to the shot but pulled the trigger anyway? Let's decide and commit to breaking that bad habit today. Stay Down during the entirety of the shot. Don't be a Jack-in-the-box. Developing a consistent stroke can only happen by keeping your head down the entire time. Give yourself the best chance at pocketing the ball by allowing your stroke to follow through on a consistent, level plane. It's particularly easy to hop up on a shot when we are not committed to it, uncomfortable with something, or just being careless. Record yourself or have someone take notice of this for you. Are you hopping up from nerves or excitement? If so, make a point to consciously stay down from now on until every single ball has stopped moving (or a ball is coming at you). Exaggerating this action will only help reinforce it. Follow through completely. When you finally pull the trigger, your shooting arm should be fully accelerated and your cue tip should be pointed into the table through where the cue ball once was. Ideally, this happens without dropping the elbow but in some instances it's unavoidable. Follow though completely on each and every shot to achieve the best results. You don't see Tiger Woods stopping his club once he contacts the golf ball. Following through completely not only maximizes the momentum of the forward stroke, but it also helps you identify any flaws in your stroke. If your follow-through finishes with your cue tip pointing up in the air, then you have excessively dropped your elbow. You may even be gripping the cue too tightly. If your follow-through finishes to the left or the right, then you may not be pulling back straight. Staying down after the follow-through gives you the chance to notice all these things. Frank Says: "A great way to achieve maximum consistency is with the fully Bluetooth enabled OB DigiCue BLUE! Use the app and get instantaneous feedback on your stroke." 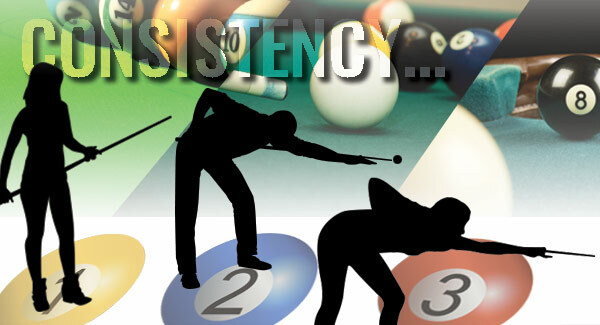 Follow these steps to improving your consistency. Train yourself to go through the checklist every time you come to the table. Pocket more balls and have more fun! 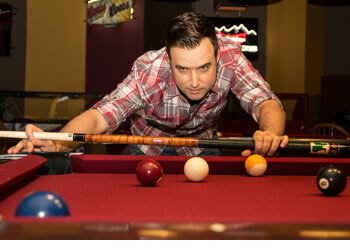 Player, writer, and Denver billiard instructor Samm Diep shares tips on basic care, instruction, and etiquette. Check back frequently for more articles.